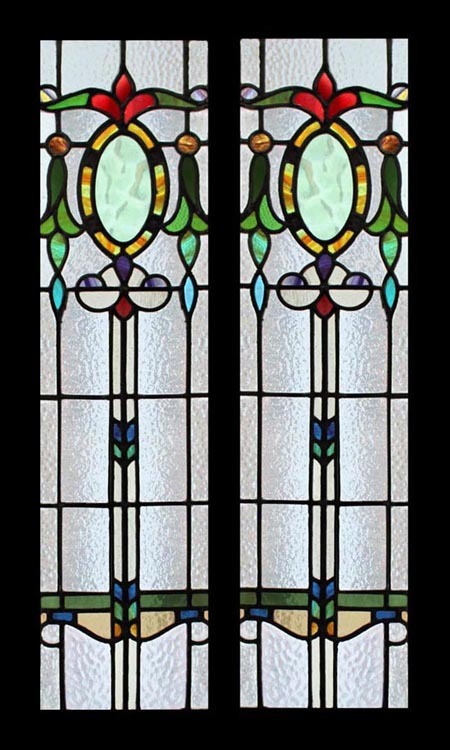 These Beautiful Antique windows have outlived the original frames, and been placed in substantial pine frames. The glass has no chips or scratches and the leading is good. BEAUTIFUL ORNATE DESIGN . GREENS - GOLD - RUBY A striking work of art containing some very rare and beautiful glass. Removed from a property in HUDDERSFIELD YORKSHIRE around the 1908 mark. This old heavy glass picks up and softly diffuses the colour of the light falling upon it, THE GLASS IS TEXTURED SO AFFORDS PRIVACY WHILST LETTING LOADS OF LIGHT THROUGH. The glass is 10 3/4" x 41" Shipping and packing for USA would cost $199.